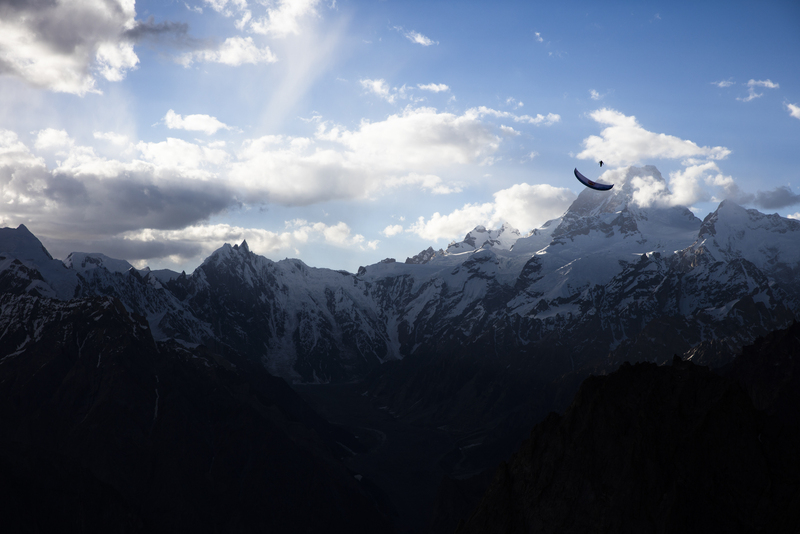 It had been five years since our team had last been in Pakistan paragliding amid the grandeur of the Karakoram Range. 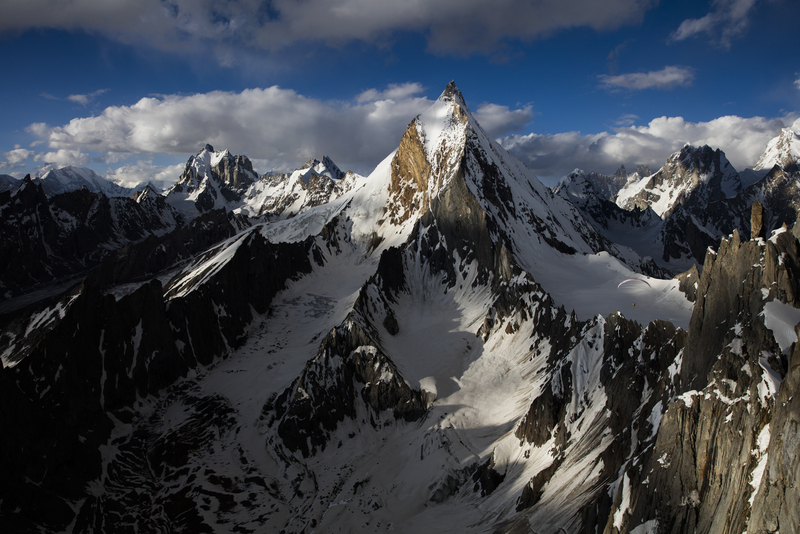 We were back to return to Hushe Valley and fly over the heart of the Karakoram Range at high altitudes. 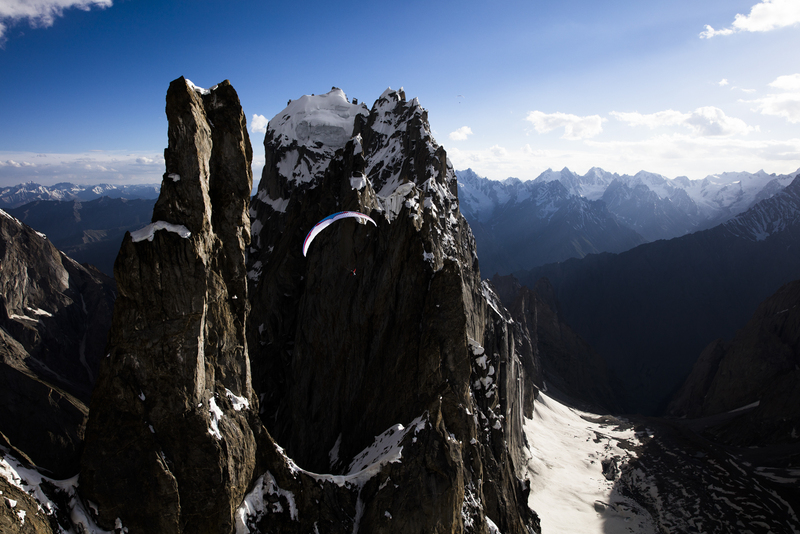 We were lucky to have flown into Skardu and avoided the twenty-hour drive. From there, it was a five-hour drive to Hushe on rough roads. 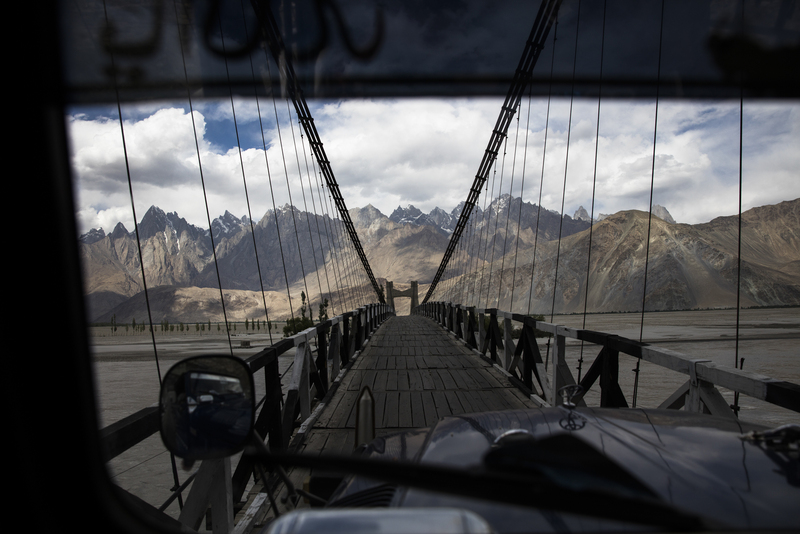 The last time I crossed this bridge over the Shyok River, five years earlier, I was in a stretcher being evacuated to a military hospital in Skardu. One of my eyes was swollen shut and the other eye saw these mountains turn golden in the fading light. The scene remained imprinted in my dreams. Ever since, each of us wanted to come back to this place! 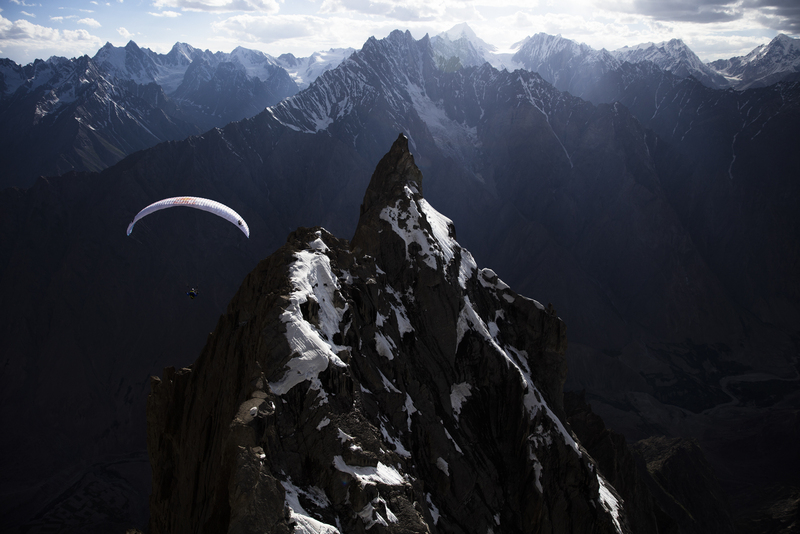 Belgian pilot Tom de Dorlodot flies towards Drifika Peak (6447m) in the late afternoon sun. Five years ago, I had hoped for a flight like this one, during which I could watch the shadows grow long across the ground as the sun lowered to the horizon. It's tough to get the images I want with paragliding because I have to fly when the conditions allow for it, which doesn't always mean the best light. The weather was more tumultuous on this trip, challenging all of us on takeoff and making it harder to find the thermals that would carry us up out of the valley. There were many times that such flights didn't happen. For me, it was worth the five-year wait to enjoy this afternoon as we flew until the sun dipped. I also discovered that my eyeballs were wind burned because my excitement overrode common sense and I kept my goggles off the entire time so I could see through the viewfinder. It doesn't take long before we are reminded of how small and insignificant we become against the scale of the mountains. 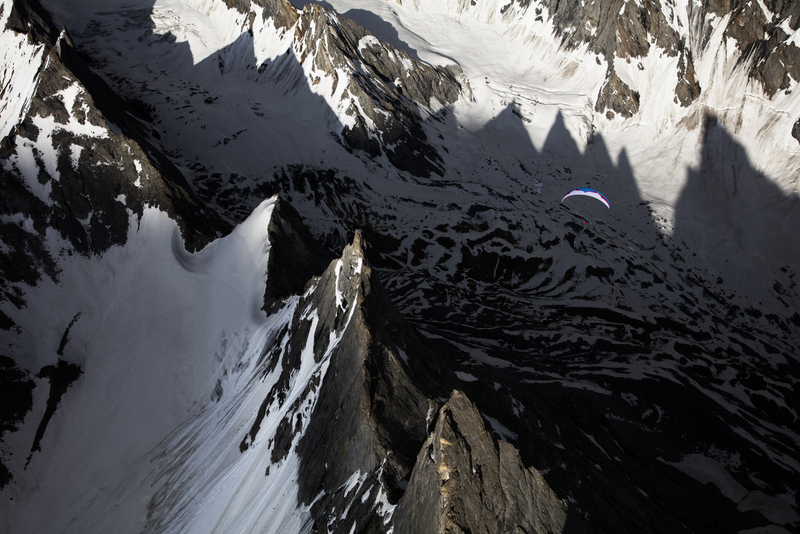 In this photo, Argentinian pilot Hernan Pitocco flies above giant shadows in the Karakoram Range in northern Pakistan. 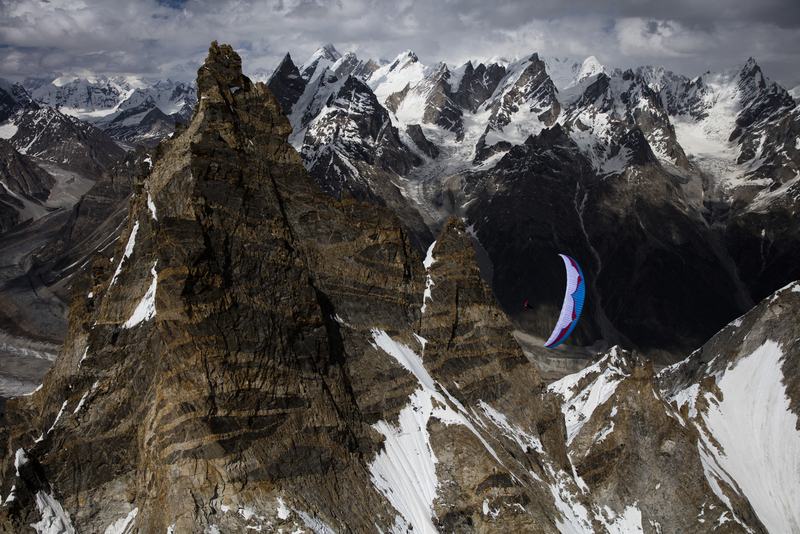 To experience the Karakoram by air is like a dream as we soar among giant spires and ridgelines that extend as far as the eye can see. This afternoon Pitocco circled around an unnamed spire above the Hushe Valley. If you look closely, you can see Laila Peak (6096m) in the background. In fact, in almost any direction, you can glimpse many classic mountains that define the beauty of the Karakoram. In this photo Argentinian pilot Hernan Pitocco plays along the ridgeline as we tried to fly towards the peak of Masherbrum (8061m). Ultimately the weather deteriorated, and it became impossible to find thermals to keep us up in the sky. It was a continual risk, as the valley floors didn't always offer many places to land. It was a balance act of searching for thermals while keeping a close eye on an exit plan, since landing in the wrong valley could mean days or even weeks of trekking back to Hushe. Spanish pilot Horacio Llorens traces the ridgeline overlooking Hushe Valley. The beauty of flight can be so easily taken for granted. But when we are constantly reminded that we always have to return to the ground, it makes it a little more magical to be in the sky, soaring above one of the greatest, most beautiful mountain ranges in the world. Llorens is one of the world's best acro pilots. Here he performs a series of wingover maneuvers as we descend into Hushe Valley. The fading light is still brushing the ridgelines of Masherbrum (8061m). For those in search of the right opportunity to fly at extreme altitudes, the Karakoram Range is perfect because the cloud base can be much higher than it is in other places. Clouds pose a range of dangers for pilots who risk flying through them, because of their tumultuous nature. The higher the clouds, the higher pilots can fly safely.